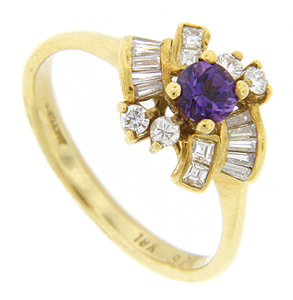 Round, baguette and square faceted diamonds surround a amethyst on this 14K yellow gold estate ring. 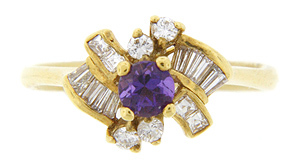 The round amethyst is the central focal point with a spray diamonds accenting the deep purple hue. Circa: 1970. Size: 6 1/4. We can resize.